Brand New and exciting! This sumptuous contemporary home, designed by Silverie and Associates, is a Masterpiece! Sited on a captivating, private 2.67 acre promontory lot, the soft exterior Mediterranean architecture melds beautifully with dramatically bold and luxurious contemporary interiors. A charming stone walkway leads guests to striking glass and bronze front doors. Enter to a dramatic living room, the center of this magnificent residence, with soaring ceilings, walls of glass and exquisite custom lighting fixtures. 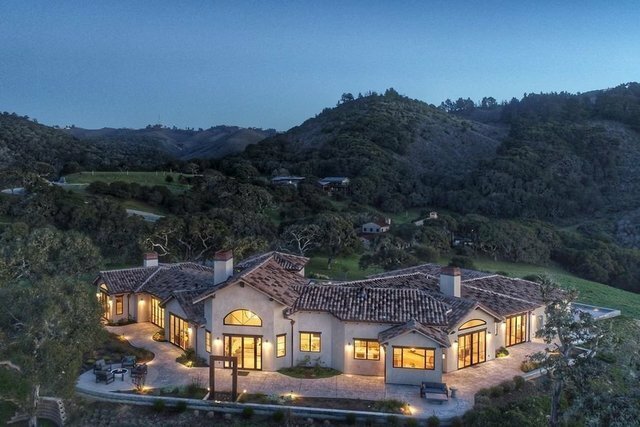 The eye is immediately drawn through the home to stunning views of majestic oak trees, verdant rolling hillsides and the Monterey Bay. Offering over 5200sf this beautiful residence was thoughtfully laid out for privacy and comfort. The spacious and functional Single level floorplan includes four bedroom suites and a fifth full bath that are strategically located in separate wings of the home. Common areas feature an amazing dream kitchen with magnificent white marble center island, striking Great Room with fireplace, elegant dining room, separate office and media room. A lavish 5 bay garage will delight all car enthusiasts! Interior details of this residence astound with exquisite craftsmanship reflected in gorgeous white oak flooring, Kalta Fiore and Winter Frost white marble slab and tile, Kolbe Vista luxe windows and doors, Bauformat European cabinetry, top of the line Subzero and Viking kitchen appliances, striking custom Gavin Cooper lighting design, radiant heat, Creston programmable lighting system, and exquisite furnishings, staged by Donna Brusascheti Designs.The luxurious Master Retreat entices with soft textures, a soothing gray and white color palette, custom fireplace and spacious seating area. A serene spa bathroom features separate vanities, rain shower and free standing tub.Enjoy your private oasis within minutes of all of the world class attractions on the Monterey Peninsula!